As we age, we start experiencing various pains and degrees of discomfort in the knees, hips, and anywhere joints are involved. Even walking can become painful and staying healthy during the later years in life becomes more difficult with our ability to move terribly impaired. Dietary supplements are a good solution when you do not suffer from a medical condition and you just experience stiff joints due to aging. One product that caters to such needs is Flexwell Joint Supplement. Based on powerful ingredients that have been thoroughly tested by health care professionals, this product looks like a good choice when you want to improve your mobility and the health of your joints. What Does Flexwell Joint Supplement Contain? Glucosamine Sulfate – this ingredient is often used in joint health supplements, because it strengthens the cartilage and helps it become more mobile. Methylsulfonylmethane (MSM) – it is particularly helpful for reducing swelling and joint pains. Boswellia Serrata Extract – this one aids the normal joint function. White Willow Extract – a pain reliever that is also helpful for reducing discomfort. Ginger Extract – this is useful to reduce the pains after you exercise. Turmeric Extract – an anti-oxidant with overall effect for your joint health. From the list of ingredients, Flexwell Joint Supplement sounds like a reliable product for maintaining your joints healthy and more mobile. Some of them have been traditionally used for joint pains, and they are useful for reducing discomfort. According to the manufacturer, you will have to take three pills daily to notice effects. Taking this treatment for at least 8 weeks is needed to see the best results. Each bottle contains 90 capsules. One particular issue we could not help but notice about this particular joint health supplement is that the price is not showed on the manufacturer’s website. This is a terrible overlook, since anyone is entitled to know the price before ordering. The manufacturer offers 30 days money back guarantee policy and there is also one free bottle included with the first order. 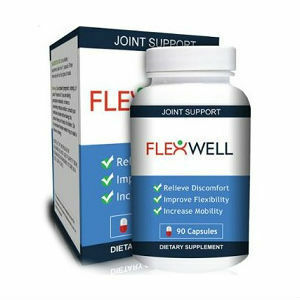 Taking a look at the list of ingredients for Flexwell Joint Supplement makes it clear that this is a product made with the best ingredients for joint pains and discomfort. However, not all the most efficient ingredients are included, and the fact that there is not a price per bottle offered on the official website is a downside that cannot be overlooked. Mark Stevens	reviewed Flexwell	on September 19th	 and gave it a rating of 2.5.